A furnished yurt in a prime position on a popular camping and glamping site overlooking Dorset's Stour Valley. 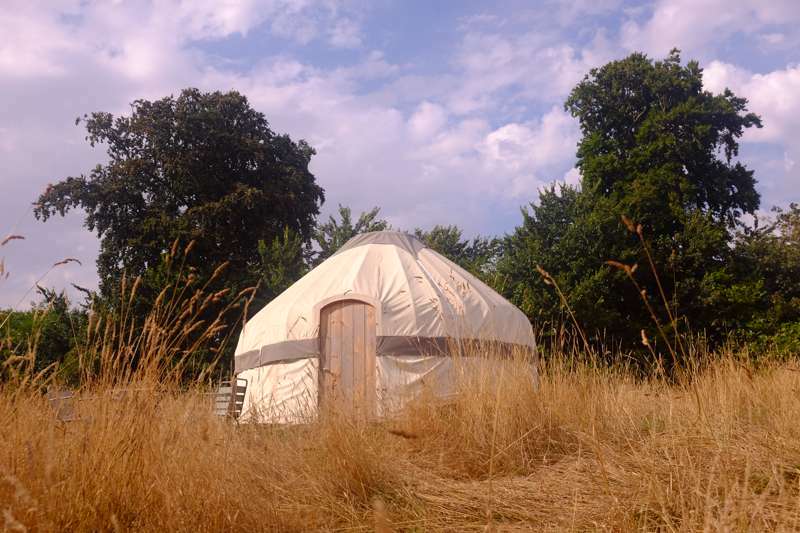 Enjoy nomadic nights in Dorset with a stay in one of our three Kyrgyz yurts which are fully furnished with a double bed and two camp beds. They are equipped with crockery and a stove and outside also have a table with outdoor seating, a fit pit and barbecue. Our yurts ideally suit a family of four (two adults and two children). The double bed will made up, all you need to bring is the kids' bedding and towels. The yurts are located at the top of our meadow but we will deliver your belongings directly to your door, just ask one of us on site! During your stay, you will have use of our eco loos and hot showers which are housed in upcycled horse boxes. Farrs Meadow looks out across the Stour Valley and is perched on a hill and surrounded by woodland. It is a only few minutes walk by footpath to the River Stour where campers can swim and fish. The pretty Vine pub, in the thatched hamlet of Pamphill, is a short stroll across the fields and it is only a 15-minute walk to Wimborne Town centre, with all its facilities and visitor attractions. Our site also lies on the National Cycle Network, Route 25. A selection of great routes can be followed by those wishing to explore the area by bicycle. We can also arrange fly fishing on one of Dorset's finest and most private chalk streams, the River Allen, on the Deans Court's beat. Course fishing can be arranged on the River Stour, again on the private banks of Deans Court Estate. Perched on a hill just outside the pretty market town of Wimborne, with far-reaching views across the Stour Valley, Farrs Meadow is a rural camping gem with a wonderfully relaxed atmosphere. It's a perfect choice for anyone looking for a touch of wilderness that's not too far from civilization. Toilets: 4 Long drop loos. Showers: 3 Hot Showers; All in upcycled horseboxes. 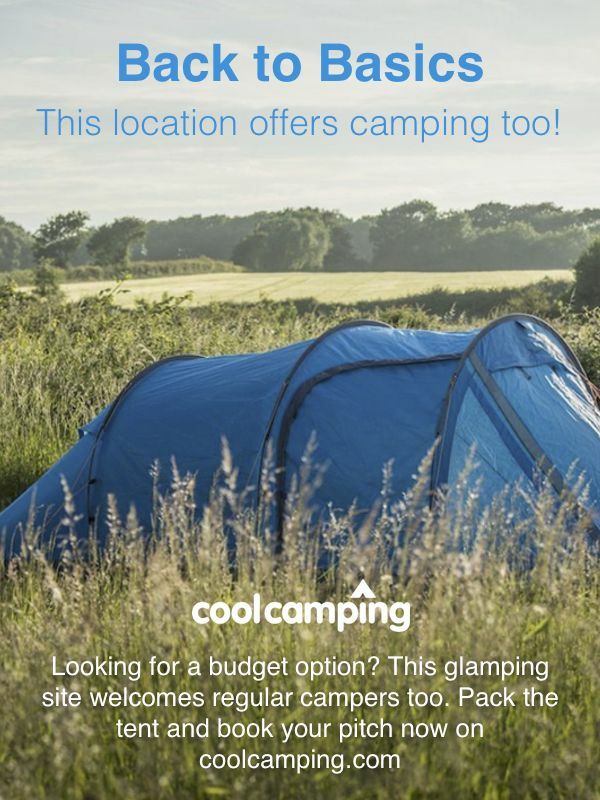 They aim for the site to be as close to wild camping as possible: Spot the deer and foxes in the early hours, buzzards and owls at night and enjoy natural cooking on the firepit and barbeques. There are rope swings, woods to build dens in and a secret garden with an orchard, greenhouses and a small pond to sit by. Throughout the season goats and alpacas are on grass mowing duty. The campsite overlooks the Stour Valley and the river is a mere 5 minutes walk from Farr's Meadow. The Stour offers some of the best wild swimming in England, perfect for whiling a day away. Farr's Meadow offer fly fishing and course fishing on the Stour and the River Allen (guides optional). Some of the best beaches in Dorset are within 20 minutes drive. There are plenty of great marked bicycle routes nearby and National Trust walking routes border the campsite. For the rainy days Wimborne, with its famous Minster (01202 884753), is a 10 minute walk away, while Kingston Lacy (01202 883402) and Badbury Rings are a 10 minute drive. Further afield Bournemouth and Poole make for popular day trips, while the Jurassic Coast is just over 45 minutes in the car. An onsite shop sells home grown organic vegetables, eggs and a simple range of camping essentials. A swap shop allows campers to pick up and leave items for each other. Local pub, The Vine Inn (01202 882259), is less than a 10 minute walk across the fields and is owned by the National Trust, boasting the smallest public bar in the country. The Squash Court Shop & Cafe (01202 639249) is also recommended, with vintage clothes and homewares and a wonderful organic cafe selling homemade food from the Deans Court Estate. In Wimborne, you'll find a good selection of restaurants and pubs including the child-friendly Olive Branch (01202 884686), Number 9 (01202 887557) and The Tickled Pig (01202 886778). There's also a Waitrose and Co-op supermarket. Wimborne Minster to Farrs Meadow is just 1.5 miles. From Wimborne head out towards Blanford Forum on Victoria Road (B3082). Turn left on to Cowgrove Road at the Hospital. Keep going past the Football club and Farrs House (big White house on your right). Farrs Meadow is the 2nd drive, 30 metres, on your right after Farrs House. It is signposted Farrs Lodge and Farrs Meadow. Drive slowly if its your first time as its easy to miss! There are two bus companies operating regular services to and from Wimborne Minster. There are several taxi companies to choose from in Wimborne Minster but we highly recommend and work closely with Apollo Taxis 01202 887766. Taxi ranks are in High Street and West Borough, both central to the town. The nearest train station is Poole (0845 748 4950). There are regular services from London and Weymouth, amongst others. Taxis or buses are regularly available for the 8 mile journey. International Airports at both Bournemouth & Southampton. 15 tent pitches, 2 furnished gypsy wagons, 2 furnished shepherd's huts, 3 furnished yurts and a unique stable accommodation. All furnished accommodation options sleep 2–4 people.